(1662-1722), when production in the porcelain kilns in Jingdezhen was at its height. 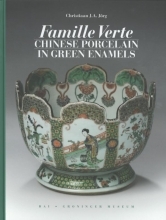 As a new, modern type of ware, famille verte enjoyed a widespread appeal and was produced for the domestic Chinese market as well as for export to Europe. Simply put, famille verte wares are extraordinarily fine and beautiful objects. The colourful decorations of flowers, butterflies, mythical animals or Chinese figural scenes are rendered in painstaking detail.